For a house synonymous with luxury, it makes sense that its ready-to-wear collection should look unmistakably rich in a completely understated and sophisticated way. When you’re able to spend at the Hermès level you don’t need to show off your riches; people just simply know you are. 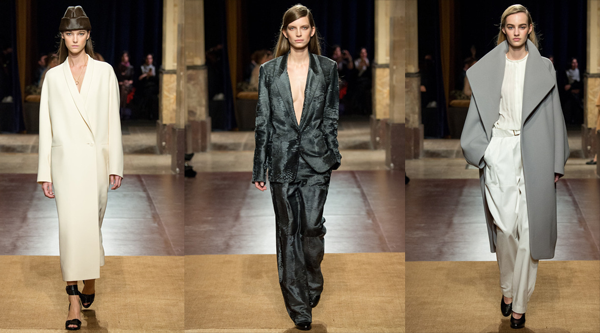 That’s why Christophe Lemaire‘s runway included a classic tailored suit in deep forest green done entirely in astrakhan, a grey overcoat with an exaggerated shawl collar worn over a white shirt with white leg pants is a straightforward concept that screams chic, and a minimalist long white dress coat with a single button can be a statement piece. You can practically envision the worldly woman that would wear this off the catwalk—and worldly was exactly what Lemaire was going for. His inspirations this season? The Russian Steppe, the Silk Road, and Persian carpets. Parka perfection! Miuccia Prada schemed up myriad new takes on the anorak, the mac, or what have you—all practical in essence, designed to shield from the elements in a cheekily chic manner. Yet another runway example of the normcore moment? Definitely, but that’s what the Prada ethos has long been about, in some shape or form. After the opening parade of subtly sporty pastel toppers and minis, quilted yet slim, the palette deepened, and those same fresh separates were trotted out in Crayola brights and jewel tones. Heavily encrusted brocade minidresses, often outfitted with contrasting PVC panels covering the collarbones and décolletage, were then added to the mix. Many looks were paired with pointy-toed kicks, low-slung and sporting heels constructed of perpendicular metal bars, resembling nails and bits of a toolbox, in bow-trimmed brocade. Delicately strappy sandals also hit that amalgam of casual and gussied up. All in all? Utterly fresh. In other words, de rigueur for a Miuccia conceit. When Zuhair Murad turns to creepy-crawlies for inspiration, the result is an elegant yet sexed-up collection of evening-apropos wares. Specifically, he honed in on butterflies and dragonflies, zeroing in on their intricate details and vibrant hues. Silver screen starlets will undoubtedly be attracted to the gowns with butterfly-esque beaded bodices and sequin-dusted mini dresses. Muhar’s artistry with embroidery is on full display here; a burgundy floor length number with a slit that reached far past the thigh, also featured a spell-bounding sequin detailed sleeve. As for separates? Those were decidedly on the sexier side as well, like a leather jacket and skirt pairing with a prominent lace-up detail. A pair of sheer, sequined leggings were also a bit racy, but have the making for a big red carpet moment when accompanied with a proper tuxedo jacket.